Abstract : "This paper presents a new master manipulator applied to robotic systems for arrhythmia ablation. The manipulator is designed to implement the concept of two different master-slave teleoperation controls in the clinical application. One is the conventional control between the master and catheter-handle in the slave site and the other is catheter tip manipulation corresponding the master motion. For the purpose, the master has six degrees of freedom (DOF) and consists of three main components: a spherical mechanism for rotational motion of 2-DOF, 3-RRR planar parallel mechanism with 3-DOF, and counter-weight lifting mechanism for the vertical movement. Two mechanisms except the lifting mechanism are parallel chains and structurally more complicated. Therefore, their forward kinematics are analyzed, and workspaces are simulated. To evaluate the applicability for robotic catheter systems, the manipulator prototype was tested for its smoothness, workspace, and teleoperation performance. The subjects in the smoothness test reported no considerable friction and jerk in free movement in the three-dimensional space as shown in the recorded curves. The workspace test shows the actual workspace is similar to the simulated one except some structural constraints in the 3-RRR mechanism. 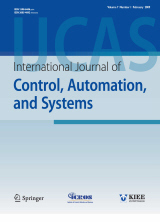 For the last test, a robotic catheter teleoperation system with a slave robot and the software structure for the robotic catheter control system with electrical connection of each component were built. The result performed by five different users shows the motion of the slave robot well tracks that of the master device with small average errors and time delay that are acceptable in robotic catheter teleoperation systems." Keyword : EP catheter robot, master device, master-slave system, robotic interventional system.